When the condition of the weeder (grass mower and brush cutter) is bad, the grass cannot be cut. I might get irritated though I want to use even at once. If the knack is gripped, it is possible never to never do though the amateur's repair is not easy. Which is the reason that the gasoline engine doesn't start, in the fuel system or the ignition system or the inlet system or the exhaust system? In most cases, if it can diagnose the which is bad, it is possible to repair. Diagnoses it as follows. The engine doesn't start when it makes a mistake in the fuel. If it is two cycles, the composite fuel (The humidity mixing ratio is noted) is used. If it is four cycles, usual gasoline is used. You will not use too old gasoline. Is not gasoline breathed in too much or gasoline checks and the Japanese pampas grass checks whether to pass. If the sparking plug is removed and seen, it understands. The wet condition of the sparking plug is checked. The dirt condition of the adhesion of the carbon etc. is checked according to whether the gap of the sparking plug (0.7-1mm usually) is regulations. The gap of the sparking plug is corrected and it cleans it. The temperature of the sparking plug might lower when the rotation of the engine is slowed down and used, and the carbon adhere to the sparking plug. Let's use the engine because of the rotation more than to some degree. 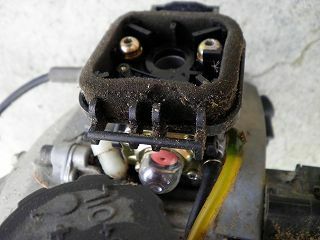 The spark of the sparking plug is bad and when the engine doesn't start in a normal case, the condition of the carburetor (vaporizer) might be bad. In that case, it is a cleaning after disassembling of the carburetor (chiefly main jet). It checks whether the air cleaner in the suction part is no blocked the sponge is not deteriorated. The engine doesn't start even if the muffler is blocked. Let's check whether the muffler is blocked. When the grass mower is used for years, parts that can be done with the rubber product are deteriorated. This photograph was put into the state that rubber of a primary pump (primer pump or priming pump) that took the vaporizer (carburetor) apart and sent the fuel of the engine first Priming body was able to be exchanged. The priming body consists of the material like transparent rubber. If four plus screws are removed from this state, the priming bodies can be easily exchanged. The fuel (mixed oil) is sent to the vaporizer pushing here several times before the engine is started. 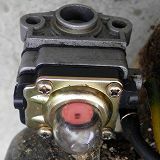 The role of the pump is not done at all when the priming body tears, and the engine doesn't start. The vaporizer (carburetor) is previously removed because the fuel tank becomes obstructive and it doesn't come off to exchange the priming bodies. First of all, this photograph removed the air cleaner cover of the vaporizer. Two screws in the upper part of this photograph are removed by Allen wrench and the vaporizer is taken out. And, it puts into the state like the photograph above and the priming bodies are exchanged. Even if the model is different, this priming body can often be used together. Parts of the grass mower can be bought even by optimism. The condition of the weeder worsened this time and the maintenance of the weeder was repaired for myself though it was not necessary to break down so in case of being without negligence. The engine cover was removed, the muffler was removed, and it cleaned it. There were many masses of the carbon in the muffler. Because the exit of the muffler is small, it is blocked in this and it is natural. Moreover, soil bee often builds the nest in the muffler of the grass mower kept for years. It is likely to be able to repair easily when often observing it though it does at the drop of a hat.